Crude oil prices have been getting crushed over the past few months. The decline in oil makes the stock market’s run look pretty good, with crude falling almost 35% from peak to trough after coming into October near its highs. That of course has weighed on oil stocks as well. But just like tech stocks that get crushed when the Nasdaq Composite is under pressure, not all oil stocks should be thrown out. In fact, many of them have low valuations, large dividends and strong balance sheets. Many investors view oil in a different light. Some view rising oil prices as a negative burden, something that weighs on consumers and hurts their purchasing power. In a way this is true. After all, think of how happy everyone is when gas is falling and we have a little extra dough in our pockets. That said, many view oil prices as an economic indicator. That being said, as the economy continues to grow and improve, so too does demand for energy. As demand rises for oil, so does its price. Of course, it’s not as simple as that once we start considering the supply side of things — i.e., companies pumping out oil of the ground at differing rates — and then factoring in the countless political parties involved. That side of the market can be a headache, but I wouldn’t throw out all of the oil stocks. In fact, let’s see which are worthy buys. While far from good, BP plc (NYSE:BP) being down “just” 10.5% from the start of October is certainly encouraging to some investors. But is it enough to pull in investors on the long side? I think so. Let’s start with perhaps BP’s largest attraction: its dividend. Shares currently yield 6%, following the company’s dividend hike in July. The raise would suggest that BP management isn’t worried about its high yield, even in the face of declining oil prices. Of course, it helps buying a high-yield stock when the valuation is low too. Shares trade at roughly 11 times this year’s earnings. Three quarters of the way through fiscal 2018 now, current expectations call for earnings to grow 96% this year. That’s assuming BP’s fourth-quarter results are in-line. However, if it’s anything like Q3 — where BP beat estimates by 34% — then the company could very well double its bottom-line results from 2017. On the sales front, estimates call for ~33% growth this year. In 2019 though, estimates for sales and earnings cool off, calling for roughly flat growth next year. If the stock didn’t trade at 11 times earnings and yield 6%, that would be a much larger turnoff than it is. Further though, as BP continues to increase its exposure in the Permian Basin — where there’s plenty of oil at low production costs — its cash flow and earnings should see an increase. As for the charts, look for support near $39.50 to $40. 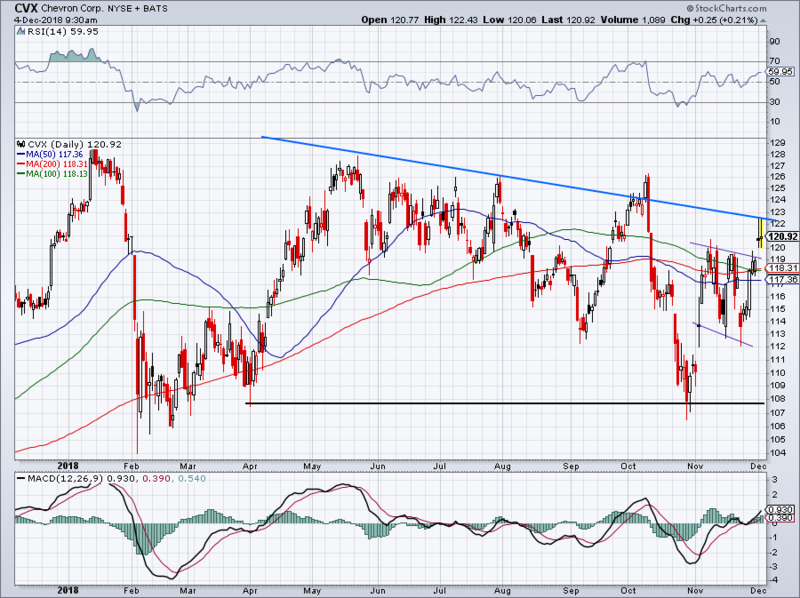 On the upside, look for resistance near $42.50, a confluence of major moving averages. Exxon Mobil (NYSE:XOM) turned in a pretty good earnings result in October, but the stock got caught up in a wave of selling. Oil prices were under pressure, as was the stock market. As a result, investors didn’t ask questions, they simply sold oil stocks lower regardless of the fundamentals. That’s what happens when everything is lumped together in index funds and ETFs. Last quarter, XOM reported earnings of $1.46 per share, 22 cents ahead of expectations on sales of $76.6 billion. The latter beat expectations by almost $1 billion and grew more than 25% year-over-year. Now that oil prices have been bouncing, we’re seeing it in XOM too. We were buyers down near $76, so we want to use some caution up here in the low-$80s. A pullback down to the 200-day would be tempting on the long side. With Exxon, we’ve got a stock that’s forecast to grow earnings 32% this year and another 18% in 2019. On the sales front, estimates call for 31% and 8% growth in 2018 and 2019, respectively. All in all, this leaves XOM stock trading at roughly 17 times this year’s estimates, a reasonable figure given its growth. On the yield front, Exxon stock pays out a 4% dividend, enticing enough for short-term and long-term traders alike. Like Exxon, Chevron (NYSE:CVX) reported pretty good quarterly results in October. We loved the name going into the report, as the risk/reward was very appealing support. 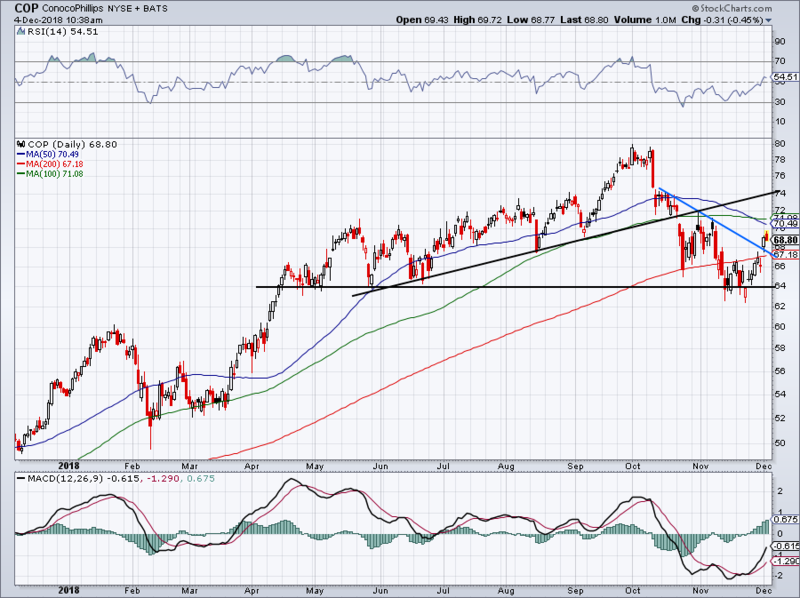 Even during the November swoon, bears couldn’t knock CVX back down to this support level. It proved to be a very prudent entry that, should it show itself again, is an area where investors should buy. That’s near this $107 to $109 area. Since then, CVX has powered through its major moving averages and is bumping into overhead resistance near $122. 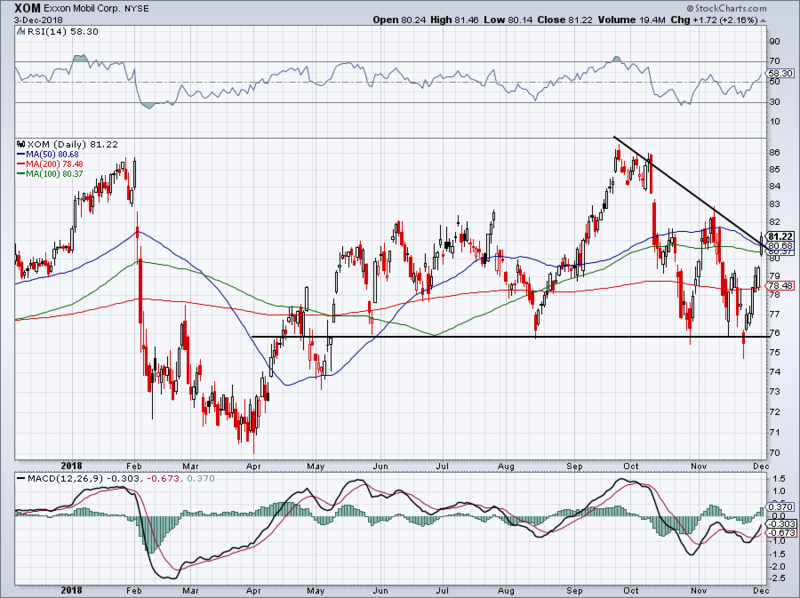 Should it resolve higher, look for CVX to run into the upper-$120s. If not, look for moving-average support below. CVX stock was more attractive when it was roughly 10% lower than current levels. Still, shares trade a reasonable 14 times this year’s earnings, which are set to grow more than 125% year-over-year. In 2019, analysts expect a further increase, this time by 11%. On the sales front, estimates call for 25% growth this year and 5.5% growth in 2019. Are you sensing a theme yet? We’ve got beaten down but recovering stock prices, with excellent 2018 growth and decent 2019 growth on reasonably valued stocks. These energy stocks also pay a healthy dividend and CVX is no exception. Shares yield 3.7%, lower than both XOM and BP, but still an above-average payout compared to most stocks. 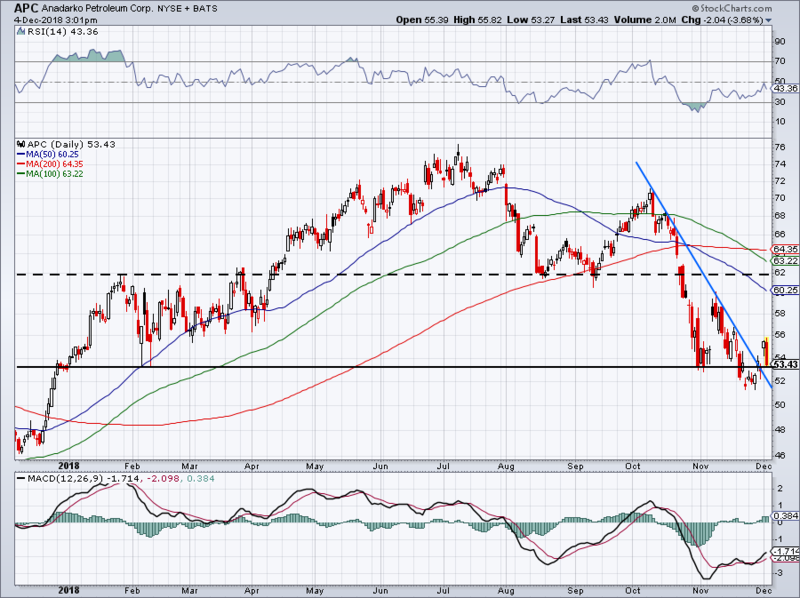 ConocoPhillips (NYSE:COP) is setting up as an interesting oil stock to buy. Paying out a dividend yield of just 1.75%, it’s not the high-yielder that some of the other names on this list are. That will inevitably keep some income-seeking investors away from it. That said, the company is “turning on the spigot” when it comes to cash flow and profitability. For instance, operating cash flow for the first three quarters of 2018 came in at $9.15 billion, almost double last year’s $4.6 billion during the first nine fiscal months of operation. Analysts expect an explosion in earnings this year, calling for $4.65 per share this year compared to just 60 cents per share in 2017. Based on those results, COP stock trades at less than 15 times earnings. In 2019, estimates call for 15% growth. Current estimates call for 20% sales growth this year and another 7.7% next year. In all, COP is running pretty smoothly and that should bode well for its financials moving forward. Unlike some of the other names on this list, Anadarko Petroleum (NYSE:APC) hasn’t had the easiest time. While others have been under pressure, most have done better than this, with APC falling almost 25% from October highs. With shares hovering around $53 support and just above its November lows around $51.50 to $52, some bulls may find this as an attractive risk/reward opportunity. Below last month’s lows and bulls may want to exit. Above and they can stay long. 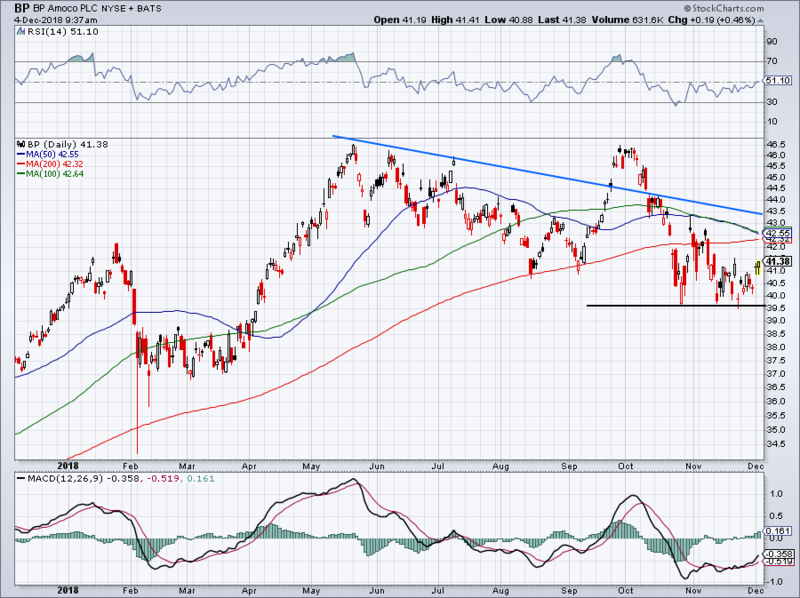 APC already broke over downtrend resistance (blue line). If it can stay above support, APC will have a chance to rally up to the 50-day moving average and possibly $62. Anadarko has strong growth too, with expectations calling for earnings of $2.79 per share this year, a huge improvement from the $1.96 per share it lost in 2017. Unfortunately, that puts the stock at 19 times this year’s earnings, a somewhat lofty number compared to others on the list. On the plus side, APC has better growth forecasts for 2019, with expectations calling for earnings growth of 40% to $3.88 per share. Shares yield about 2.2% after the company gave a 20% increase to its payout a few weeks ago. Look for management to continue boosting this payout in the years to come. 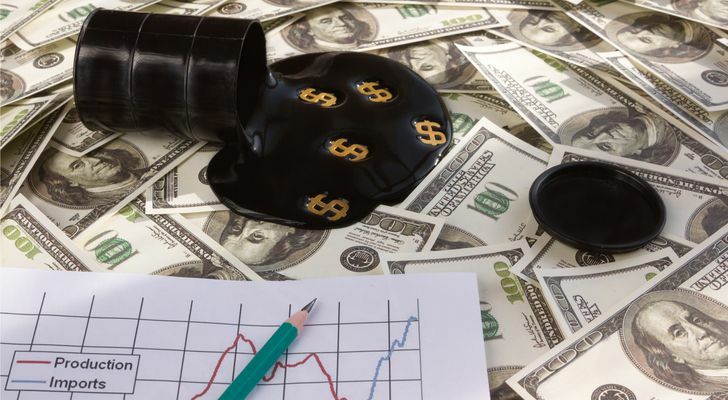 Article printed from InvestorPlace Media, https://investorplace.com/2018/12/best-oil-stocks-to-buy-cvx-cop-xom-bp-apc/.